What will you be when you grow up? The exam results will just have been out and this is the time when students of class X have to exercise their first serious choice of subjects. All of us have either already gone through or will be soon be going through this crucial phase. These days, students have a multitude of career choices. This is often both a curse and a boon. The wide variety implies that a child is no longer “compelled” to stick to routine choices. However, the confusion of having too many choices is daunting. Career choices are frequently made based on limited or inaccurate information. This leads to a de-motivated professional life. An easy to do self-assessment can help the child avoid making wrong choices. 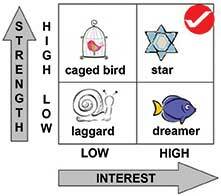 The 2 X 2 matrix is a simple tool to help the student map his strengths and interests. At a very basic level this exercise can be done for the subjects being taught at school. The article has been contributed by Butterfly Fields, a company working in the domain of innovative teaching learning techniques. To know more about the work the company does visit www.butterflyfields.com or call 040 27711020/30608888. This is an article for subscribers only. You may request the complete article by writing to us at editorial@teacherplus.org.